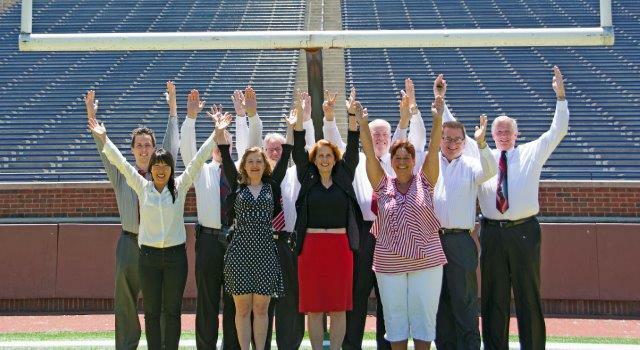 Join a Winning Ann Arbor Team! Be successful, productive and fulfilled…From our office, we serve all of Ann Arbor’s surrounding communities, Dexter, Chelsea, Saline, Pinckney and many other great neighborhoods. We also serve Oakland, Livingston, Jackson, Wayne Counties and are expanding internationally. We invite you to talk, explore, expand. Take a look at our “Questions to Ask a Broker Before you Join an Office” to help you on this journey! Training and Technology: the team is committed to helping you maximize your potential in the real estate business. We believe that team members can achieve their highest potential if given the tools and environment for success. We are committed in employing the best technology without sacrificing personal service. Quality of Life: We assist you in the development of your time management and goal setting. We will help you in setting client expectations so you don’t have to work 24 hours a day, 7 days a week. We believe that work should be fun, and we value creativity and commitment to each other in a team-oriented environment. Business Ethics: We adhere to the highest standards of ethics, integrity and honesty. We strive to be a good corporate citizen and encourage involvement by all team members in the community and the world at large. You’ll receive leads as a full-time agent on our team and be supported in lead generation with dialers, headsets and accountability. You’ll have a complete lead and contact management system with pre designed follow up, so you’ll know exactly who to call every day. You’ll get more buyer leads from our valued clients and listings with our call-capture system and full time client relationship associates (ISA). You’ll participate in private team social to collaborate, lead distribution, direct message, and cheering each other on. 20 brains are better than one. Our Marketing Company ensures that your listings are exposed to the widest audience of buyers and agents. Listing Presentation – Our pre listing presentation is bullet proof with high quality graphics and flexibility. You’ll walk into every appointment confident that you can take the listing. Buyer Presentation – Our buyer presentation is consice and complete with our value proposition, proven to generate loyal buyers. Reverse Prospecting – For any home, we can go to our database of thousands of buyers and pull a list of buyers looking for that exact type of home. Imagine presenting this list to a potential seller client. This is an extremely powerful tool that will set you apart from top agents around the country, and we offer this to every agent on our team. We work with Google Partners to ensure analytics and world wide performance is attained. We have post closing programs to help foster our life long relationships and earn referrals. Dialogue Training – Every other week you’ll get the best training on scripting and dialogues to mastery from experienced agents who are on the ground working with clients every day. You will practice so that if you are persistent you’ll get it and if you’re consistent you’ll Keep it! Don’t work to make your presence known, work to make your absence felt! You’ll learn strategies for negotiation, lead follow-up, listing presentation and dialogue, and trainings are recorded in private library so you can review these videos at your convenience. With our mentoring, you’ll know exactly what to say in every situation to overcome objections. You’ll participate in our Monday Morning Team Huddles to review prospecting numbers from the previous week and learn from each other. Success Manager – You’ll have weekly one-on-one meetings to review your goals, leads, transactions, dialogue, long-term business objectives and questions that arise from specific client situations. Lead generation finds a sale. Lead follow up find the business. Do not let negative thinking win. Thinking big is a learned process. Replant yourself into a growth environment. You’ll get the comprehensive and in-depth training you need to give the best service to your clients and attract more clients. Discipline brings more of whatever you are disciplined in. Team Activities – You’ll participate in team events, sales incentives and client parties. You can be anywhere you want in 5 years, Gary Keller. Led by Mega Agent and MAPS coach, Kathy Toth. She has personally worked with 3000 plus clients and is passionate about helping others live life by design. Showing assistants – We support alignment with showing partners who show homes so you can focus on higher-income activities. Client Care Listing Concierge – updates seller clients with showing feedback, latest market information and transaction feedback from start to after closing. Client Care Transaction Concierge – Once an offer is accepted, service is elevated with our Transaction Coordinator (TC) Team who takes the deal to closing, ensuring that all paperwork is handled, problems are prevented and your deal goes through on time. Professional Photographers – You’ll never install a lockbox or put up your own yard sign, or take photos and room measurements. We take care of everything. You’ll learn best practices for follow-up that turn internet leads into closed deals. You’ll learn how to generate clients from your own sphere and build a database that brings repeat and referral business year after year, so you depend less on internet leads and prospecting. Come join us for a weekly Monday morning huddle meeting, and get a behind-the-scenes look at our team. The first step to your successful career in real estate is choosing the right real estate broker to work for and knowing what questions to ask. There are wide differences among real estate brokerages, both in what they will offer you as well as the commission splits, expectations and culture. Many new real estate agents base their decision on the best commission split and that usually isn’t the best route, especially when you are new to the industry. 2. Are there any franchise fees? Many large real estate brokerages charge a 3% to 8% “franchise fee” on top of the commission split above, so using the example above, the broker would receive 40% , the franchise fee would be 5% and you would receive 55%). 3. Do you offer a commission cap? A commission cap is the maximum amount of commission that the brokerage will deep each year. For example, if the “cap” is $200,000 in gross commission, you will net $180,000. If an agent cap is NOT offered and you are on a 60/40 commission split, then $80,000 would go to the broker and you would net $120,000. ◦ How are the distributed among the agents? ◦ Is there a referral fee of up front charge? ◦ How many leads can I expect each week or month? ◦ Are the leads website registrations or are they actually inquiring about a specific property? 7. What type of classes do you offer and how often? Also ask if there is a cost for the classes. Many brokers offer lots of classes, but most are taught by agents in the office (i.e. your local competitors). The good classes that are taught by the brokerage may cost between $200 – $1000 per class. 9. Who can I contact if I have questions about a contract? Are they available after 5 pm if I have an urgent issue? 10. Do you have a mentor program? If so, how does it work? Typically the agent mentor program will last for your first 3 to 6 months in the business (or the first few transactions) and you may share a percentage of your sales commission with your mentor in exchange for their guidance. 11. How many real estate agents are in the office? 12. How often do you have team meetings, happy hours, lunch & learn sessions, etc? 13. Are there any meetings that are mandatory attendance? 14. Do you promote our listings, the office, and the agents? 15. Is desk or phone duty required for each agent? If so, how many hours a week? 16. Are you involved with the surrounding communities? 17. What are your expectations for me? Is there anything else that I’m required to do as an agent under your real estate brokerage? This could include selling a certain number of homes each year, being a full-time agent, attending certain meetings, etc. 18. Can you describe the atmosphere of the office? 19. Would it be possible to get a tour of the brokerage and meet some of the agents and staff? 21. Can I sit in on an upcoming training session or team meeting? FYI: While it may be difficult to determine the atmosphere and company culture of a real estate brokerage, it is critical to learn as much as possible beforehand. As a real estate agent, you work independently much of the time, but also need a supportive environment when issues arise and/or when you want to take your business to the next level. It can make a BIG difference to your success and happiness! When you are researching different real estate brokers, be sure to check out what The Toth Team Worldwide Network has to offer!